Niels Hoegel hid his face during a hearing in February, 2015. 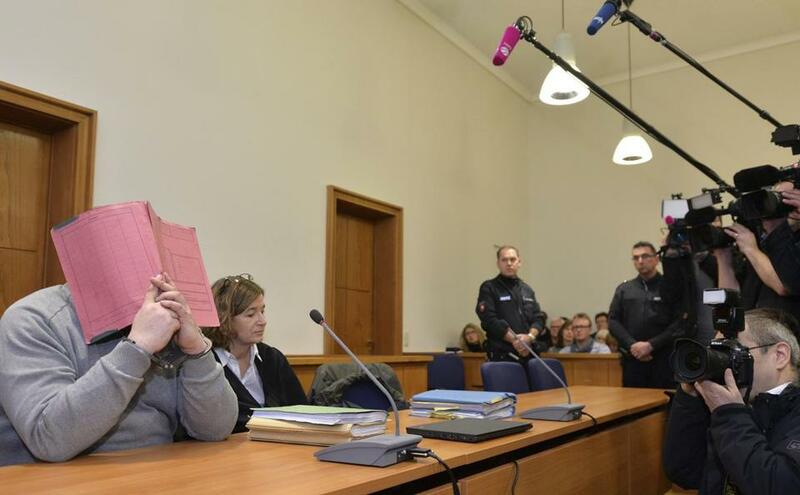 BERLIN (AP) — A German nurse who is already serving a life sentence for two murders has been charged with killing 97 more patients over several years at two hospitals in northwestern Germany, prosecutors said Monday. The new indictment against Niels Hoegel was expected after officials said in November that he may have killed more than 100 patients in total. He worked at a clinic in Oldenburg from 1999 to 2002 and in nearby Delmenhorst from 2003 to 2005. Hoegel was convicted in 2015 of two murders and two attempted murders in Delmenhorst and was given a life sentence. During his trial, Hoegel had said he intentionally brought about cardiac crises in about 90 patients in Delmenhorst because he enjoyed the feeling of being able to resuscitate them. He later told investigators that he also killed patients in Oldenburg. Those statements prompted investigators to carry out toxicological examinations on dozens of other patients who died at the hospitals, leading to the new charges. It wasn’t immediately clear when a new trial at the state court in Oldenburg might start. Additional convictions could affect Hoegel’s possibility of parole, but there are no consecutive sentences in Germany. In general, people serving life sentences are considered for parole after 15 years. Of the new cases, 62 involve patients who died in Delmenhorst and 35 patients in Oldenburg. Prosecutor Martin Koziolek said that, in three further cases investigators viewed as suspicious, tests didn’t produce enough evidence to add them to the charge sheet. Authorities are already pursuing criminal cases against former staff at the medical facilities.